Skin examination: A doctor or nurse checks the skin for moles, birthmarks, or other pigmented areas that look abnormal in color, size, shape, or texture. Suspicious areas of the skin should be biopsied and not be shaved off or cauterized (destroyed with a hot instrument, an electrical current, or a caustic substance). Whether cancer has spread to the lymph nodes or to other places in the body. The number of places cancer has spread to in the body and the level of lactate dehyrogenase (LDH) in the blood. The process used to find out whether cancer has spread within the skin or to other parts of the body is called staging. The information gathered from the staging process determines the stage of the disease. It is important to know the stage in order to plan treatment. Talk with your doctor about what the stage of your cancer is. Blood chemistry studies: A procedure in which a blood sample is checked to measure the amounts of certain substances released into the blood by organs and tissues in the body. For melanoma, the blood is checked for an enzyme called lactate dehydrogenase (LDH). 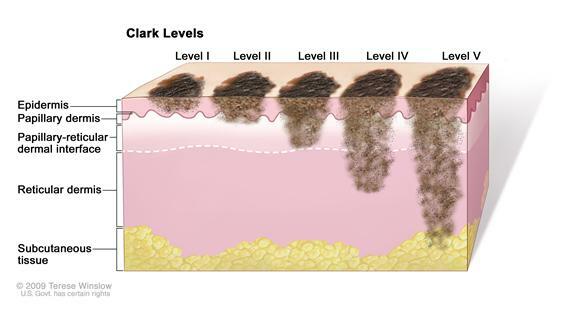 Clark levels of melanoma. In Clark Level I, the cancer is in the epidermis only. In Clark Level II, the cancer has begun to spread into the papillary dermis (upper layer of the dermis). In Clark Level III, the cancer has spread through the papillary dermis into the papillary-reticular dermal interface but not into the reticular dermis (lower layer of the dermis). In Clark Level IV, the cancer has spread into the reticular dermis. In Clark Level V, the cancer has spread into the subcutaneous tissue. The cancer is in the epidermis only. The cancer has begun to spread into the papillary dermis (upper layer of the dermis). The cancer has spread through the papillary dermis (upper layer of the dermis) into the papillary-reticular dermal interface (the layer between the papillary dermis and the reticular dermis). The cancer has spread into the reticular dermis (lower layer of the dermis). The cancer has spread into the subcutaneous layer (below the skin). 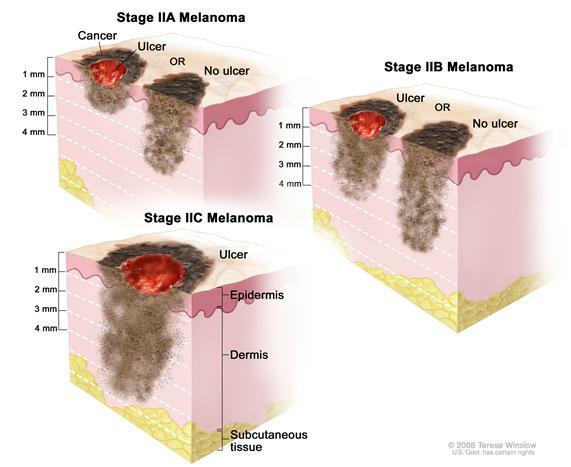 Stage 0 melanoma. 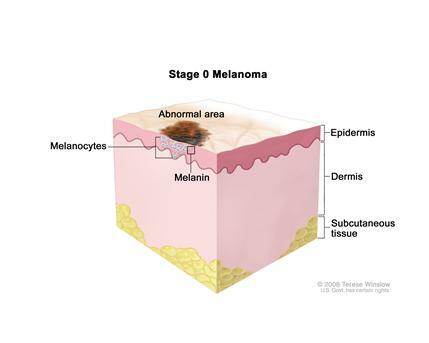 Abnormal melanocytes are in the epidermis (outer layer of the skin). 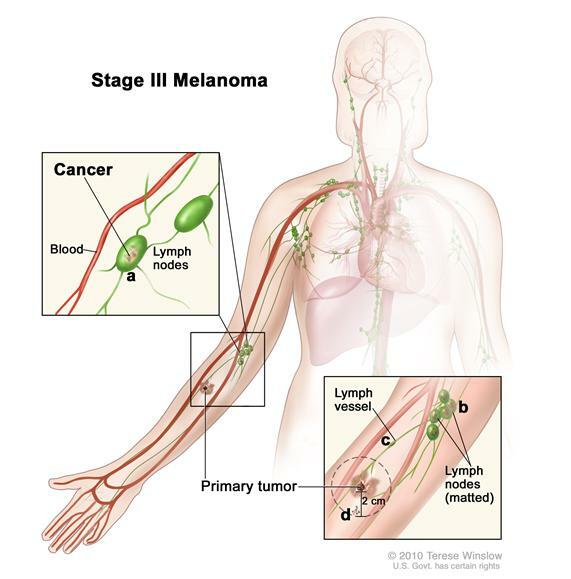 Stage III melanoma. The tumor may be any thickness with or without ulceration. It has spread either (a) into a nearby lymph vessel and may have spread to nearby lymph nodes; OR (b) to 1 or more lymph nodes, which may be matted (not moveable). 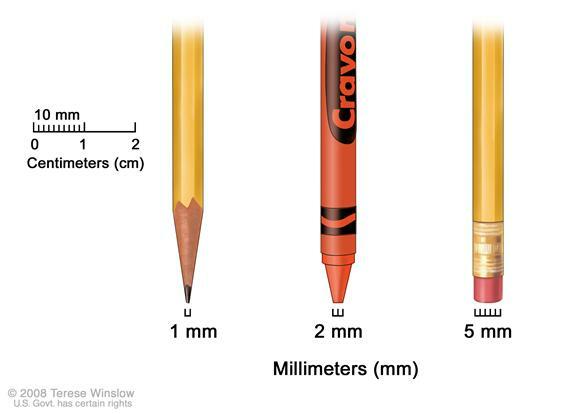 Skin thickness is different on different parts of the body. Lymph nodes may be joined together (matted). 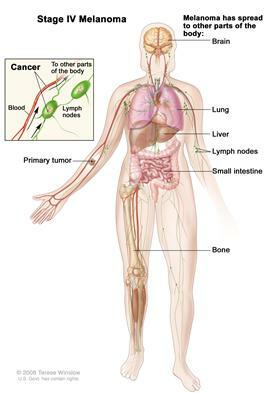 Cancer may be in a lymph vessel between the primary tumor and nearby lymph nodes. Very small tumors may be found on or under the skin, not more than 2 centimeters away from where the cancer first started. Stage IV melanoma. The tumor has spread to other parts of the body. In stage IV, the cancer has spread to other places in the body, such as the lung, liver, brain, bone, soft tissue, or gastrointestinal (GI) tract. 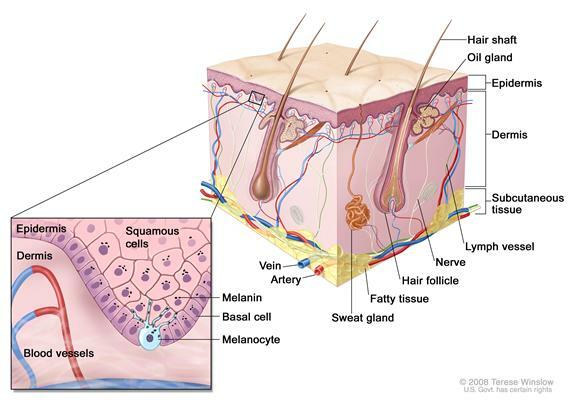 Cancer may also spread to places in the skin far away from where the cancer first started. Even if the doctor removes all the melanoma that can be seen at the time of the operation, some patients may be offered chemotherapy after surgery to kill any cancer cells that are left. Chemotherapy given after surgery, to lower the risk that the cancer will come back, is called adjuvant therapy. In treating melanoma, anticancer drugs may be given as a hyperthermic isolated limb perfusion. This technique sends anticancer drugs directly to the arm or leg in which the cancer is located. The flow of blood to and from the limb is temporarily stopped with a tourniquet, and a warm solution containing anticancer drugs is put directly into the blood of the limb. This allows the patient to receive a high dose of drugs in the area where the cancer occurred. Chemoimmunotherapy is the use of anticancer drugs combined with biologic therapy to boost the immune system to kill cancer cells. Targeted therapy is a type of treatment that uses drugs or other substances to identify and attack specific cancer cells without harming normal cells. Monoclonal antibody therapy is a type of targeted therapy being studied in the treatment of melanoma. Vaccine therapy is a type of biologic therapy. Cancer vaccines work by helping the immune system recognize and attack specific types of cancer cells. Vaccine therapy can also be a type of targeted therapy. 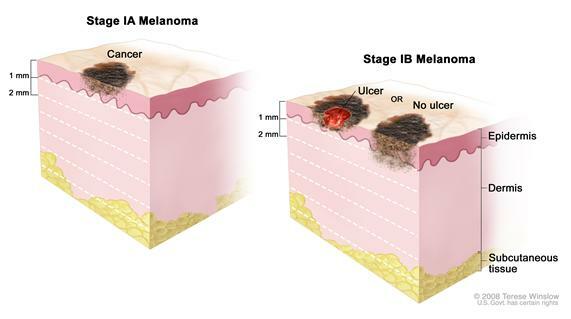 Stage 0 (Melanoma in Situ)Treatment of stage 0 is usually surgery to remove the area of abnormal cells and a small amount of normal tissue around it. Check for U.S. clinical trials from NCI’s PDQ Cancer Clinical Trials Registry that are now accepting patients with stage 0 melanoma. For more specific results, refine the search by using other search features, such as the location of the trial, the type of treatment, or the name of the drug. General information about clinical trials is available from the NCI Web site. Surgery to remove the tumor and some of the normal tissue around it. A clinical trial of surgery to remove the tumor and some of the normal tissue around it, with or without lymph node mapping and lymphadenectomy. Check for U.S. clinical trials from NCI’s PDQ Cancer Clinical Trials Registry that are now accepting patients with stage I melanoma. For more specific results, refine the search by using other search features, such as the location of the trial, the type of treatment, or the name of the drug. General information about clinical trials is available from the NCI Web site. Surgery to remove the tumor and some of the normal tissue around it, followed by removal of nearby lymph nodes. Lymph node mapping and sentinel lymph node biopsy, followed by surgery to remove the tumor and some of the normal tissue around it. 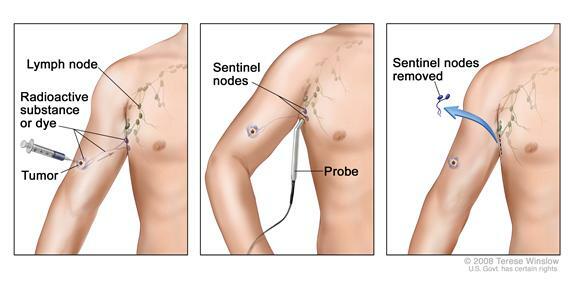 If cancer is found in the sentinel lymph node, a second surgery may be done to remove more nearby lymph nodes. Surgery followed by high- dose biologic therapy. A clinical trial of adjuvant chemotherapy and/or biologic therapy. Check for U.S. clinical trials from NCI’s PDQ Cancer Clinical Trials Registry that are now accepting patients with stage II melanoma. For more specific results, refine the search by using other search features, such as the location of the trial, the type of treatment, or the name of the drug. General information about clinical trials is available from the NCI Web site. Surgery to remove the tumor with skin grafting to cover the wound caused by surgery. Check for U.S. clinical trials from NCI’s PDQ Cancer Clinical Trials Registry that are now accepting patients with stage III melanoma. For more specific results, refine the search by using other search features, such as the location of the trial, the type of treatment, or the name of the drug. General information about clinical trials is available from the NCI Web site. Surgery or radiation therapy as palliative therapy to relieve symptoms and improve quality of life. A clinical trial of new chemotherapy, biologic therapy, and/or targeted therapy with monoclonal antibodies, or vaccine therapy. Check for U.S. clinical trials from NCI’s PDQ Cancer Clinical Trials Registry that are now accepting patients with stage IV melanoma. For more specific results, refine the search by using other search features, such as the location of the trial, the type of treatment, or the name of the drug. General information about clinical trials is available from the NCI Web site. Check for U.S. clinical trials from NCI’s PDQ Cancer Clinical Trials Registry that are now accepting patients with recurrent melanoma. For more specific results, refine the search by using other search features, such as the location of the trial, the type of treatment, or the name of the drug. General information about clinical trials is available from the NCI Web site.